As we promised in our November event recap last year, we had no plans of slowing down in 2017. In fact, we have so many events in our calendar that we’ve launched a new monthly blog series to highlight our favorite moments from our journeys. 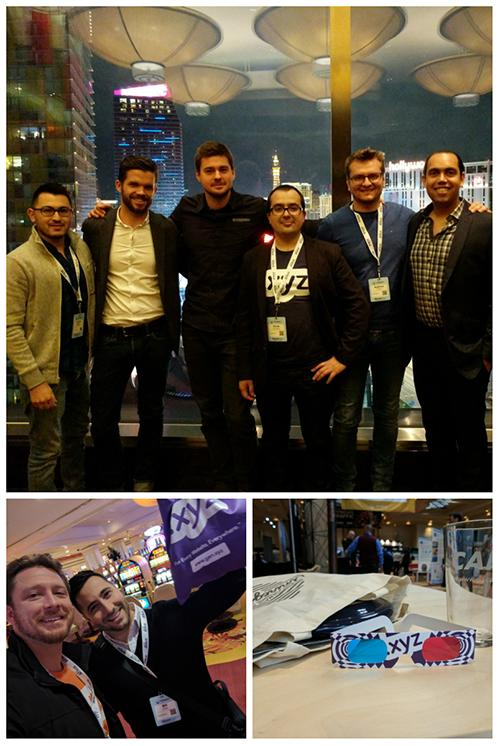 We started the year off strong by attending five events in eight different cities to spread the word about .xyz, .Cars, and our other domain extensions. Our first event of the year was the Silicon Valley Auto Show in San Jose, California. The .Cars team brought their one-of-a-kind Lucra LC470FS with them to the event, which quickly became the talk of the show. The team spoke with thousands of attendees over the course of the four day event, sharing innovative use cases like MeetOlli.Auto, FMC.Auto, Charge.Auto. Soon, word caught on, which led to our Creative Manager, Holden Andrews, getting interviewed by Chuy Gomez of Hot 105.7FM, as well as KRTY 95.3 FM. Check out more photos from the event on the .Cars Twitter and Facebook pages. 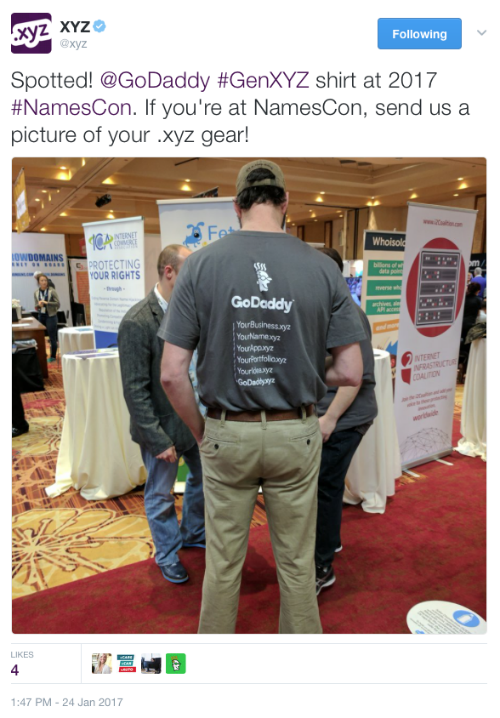 Up next was the annual NamesCon conference in Las Vegas – one of our favorite industry events of the year. Just minutes away from our Vegas office, Team XYZ was out in full force. We had some great conversations with our registrar partners, industry insiders, and bloggers about the success we had in 2016 and what we have in store this year. As one of the conference sponsors, each attendee also got a free XYZ/GoDaddy t-shirt, XYZ 3D glasses, and a .Cars pint glass. By the end of the show, we were seeing XYZ everywhere! 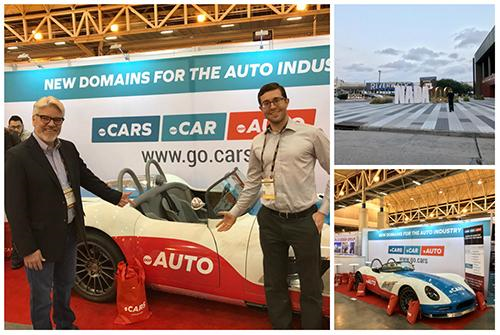 Before the dust had even settled at NamesCon, members of the team were already off to New Orleans to attend the National Automobile Dealers Association (NADA) Convention – the largest convention for franchise dealers in the country. With thousands of automotive businesses and dealer representatives in attendance, the .Cars team got the chance to demonstrate the SEO benefits of .Cars, .Car, and .Auto domains, and how migrating could help them be found more easily online (try searching for ‘Arizona cars’ or ‘Arizona used cars’ in Google to see what we mean). Several businesses registered with a GoDaddy manager onsite, including Pensacola.Cars, Spin.Car, and Costco.Auto. Be sure to follow the .Cars blog to learn when these businesses migrate their websites to their new automotive domains. Less than 24 hours after the NADA convention wrapped up, it was off to Arizona to train thousands of GoDaddy sales agents and customer care specialists before the Super Bowl. Over four days and four nights, the XYZ team RV’d to Scottsdale, Tempe, and Gilbert, followed by a flight to Hiawatha, Iowa. In the week to follow, these agents accounted for nearly 3,000 .xyz registrations themselves – including one agent who sold over 400! Be sure to read our full GoDaddy Road Show recap and check out the video below. We ended the month by sponsoring the Queen’s Startup Summit (QSS) hackathon in Ontario, Canada. QSS brings together 90 carefully selected delegates from 9 universities across Canada and places them on teams to develop forward thinking ideas in several different industries, such as green technology, food ordering, and even real estate. After 54 hours, the results are judged by leading VCs in the country. To kick off the hackathon, each attendee grabbed an XYZ t-shirt (or 30). And by day 2, everyone had switched out of their formal gear and into their comfortable (and stylish) XYZ threads. They also got free .xyz domains to build out sites for their projects. Several participants even registered their FirstNameLastName.xyz on the spot! Congratulations to Sprout, who took home the $5,000 in prize money for their indoor vertical farming solution. Sprout is currently in the process of building out their website on SproutIndoor.xyz, so stay tuned for an announcement when the site is officially launched! Now that the whole team is back home, we are planning out which events to go to next. Got any ideas? Let us know through a tweet or Facebook message!